He ao! He ao! He Aotearoa! Following a successful pilot programme in 2015, the 2017 Early Career Academic Programme will enable up to six Māori and/or Pacific scholars to receive permanent appointments as research-active lecturers in academic departments at AUT. These exceptional opportunities will enable scholars to develop their teaching skills, extend their research capability and advance their professional skills in supervision and graduate mentoring. Hosted by Dr Mera Lee-Penehira, the MAI Te Kupenga breakfast, at this years NPM International Indigenous Research Conference will be held on Monday 14 November (7am – 9am) prior to the pre-conference workshops – at Waipapa Marae, Māori Studies, University of Auckland, 16 Wynyard Street. The focus is on Māori and Indigenous (MAI) Students and recent graduates – the MAI Te Kupenga network and our visiting Indigenous students. 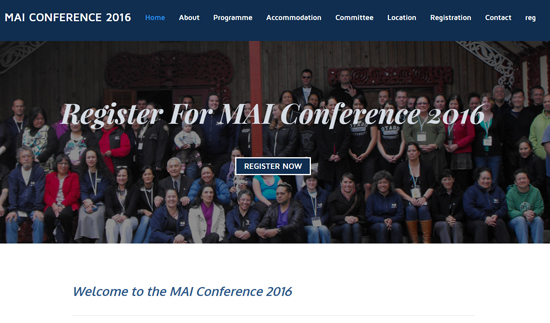 The annual Māori and Indigenous Doctoral Students' Conference (MAI Conference) is being hosted by MAI ki Pōneke this year and is being held at Te Herenga Waka Marae and Victoria University of Wellington from Wednesday 23rd - Friday 25th November 2016.